An alert reader, Stephanie, forwarded to me a link to her real estate blog wherein she described a near mishap with an incipient fire in a clothes dryer in her daughter's rental unit here in Bellingham. You can read the entire account here. To summarize, the renters were confronted with clothing that smelled like smoke after being dried in the rental's machine. The renters notified the owner who sent out a maintenance worker. The photo at left shows the enormous ball of lint that had accumulated in the dryer's ventilation system and that had nearly caught fire. 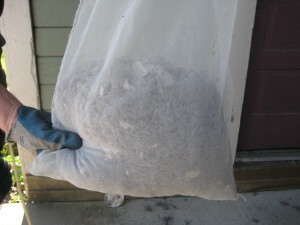 Such quantities of lint do not accumulate overnight. The blogger offers more, "This is the second apartment in two years she has lived in to have issues with the dryer venting system. Not a good record for rental owners and property management companies. 'Failure to maintain' is the leading cause of dryer fires." This is yet another fire tragedy, closely avoided, since the health and safety of renters are at the mercy of a totally unregulated rental industry. Note that in this case the landlord, who may actually be a fairly attentive one, ignored the fact that this kind of maintenance must be done regularly to avoid a fire. Lint related fires number more than 15,000 each year nationwide. They kill 15 and injure another 400. (You may wish to read this FEMA report on such incidents.) This supports my contention, made time and time again in this blog, that landlords (even the good ones) are not experts at ensuring that their units are free from health and safety hazards. Nor are tenants much better at determining whether or not their electrical, plumbing or ventilation systems are functioning properly or safely. In the case of lint clogged dryer vents, we certainly do not want tenants moving dryer units to inspect and clean the duct work. Many dryers are gas operated and moving the machine may damage the gas lines, causing leaks ... or worse. In many units, the duct work is not even readily accessible to tenants and is tucked away behind walls or in crawl spaces. The landlord may incur other liabilities if he demands that the tenant risk injury to perform such maintenance. Having a licensed inspector perform regular checks of rentals for health and safety problems is just common sense. These young women dodged a bullet as did renters over the last 18 months in fires such as the ones on Grant St., Ellis St., and Maple St. Not so lucky were the renters on 24th St.who were severely injured in a fire that also displaced two WWU students who lived in the adjacent unit of the fire-ravaged duplex. Yet, the noodle of rental inspection is still being pushed along as if waiting for some grand tragedy to befall some renters to serve as a call to action. I have been speaking to this issue now more than 5 years. A friend in the York neighborhood found evidence in the files of that neighborhood association that the problem of deteriorating conditions in rentals was surfaced in Bellingham twenty years ago. I was at a recent retreat attended by council members and city staff, to include the mayor. The only council priority that was placed in consideration for the 2013 city budget was affordable housing. This is laudable pursuit - affordable housing, however, the part about keeping our present stock of barely affordable rental property in livable condition, as in inspections, did not make the 2013 budget. In an email exchange with, Stephanie, my real estate blogger acquaintance, I determined that she supports inspections of rentals. I urged her and I invite you to write to the mayor (klinville@cob.org) and to the council (ccmail@cob.org) to let them know that NOW is the time for action on licensing and inspection of rentals and that all those who live in this city deserve affordable and, moreover, safe housing. According to an article in the student newspaper, the Western Front, there is a new student push for the licensing and inspection of Bellingham rentals. You can read the article by clicking here. Previously, the editorial board of the Western Front has come out in support of rental inspections. Click here to read the 2010 editorial. The Associated Students had already published one resolution supporting rental licensing and inspections. You can click here to read the 2010 A/S resolution. It is time for the city council to move on this important health and safety measure and create a robust rental licensing and mandatory inspection program. Let the city council know that you are concerned about the health and safety of our renters who occupy over 50% of the city's housing. You can reach the city council at ccmail@cob.org. You can also call on our new mayor, Kelli Linville, to push for an ordinance. You can reach her at klinville@cob.org.